Our high quality catered lunches, including delicious food items such as sub sandwiches, pizza, cookies and brownies, draw crowds of researchers. Our prize opportunities are also a major advantage for attendees who come to our events, and exhibitors who distribute event bags and lanyards attract significant numbers of researchers. To learn more about sponsoring a prize table at our Urbana-Champaign event, see Increase Laboratory Product Sales with Event Sponsorships. At the Urbana-Champaign BioResearch Product Faire expo, you will get the chance to meet researchers with millions of dollars in life science funding available for purchasing the latest life science solutions available on the market. This life science marketing opportunity is the perfect way to increase your short-term and long-term lab product sales in a well-funded science research marketplace. The University of Illinois, Urbana-Champaign has a wealth of research funding. In 2013, the University of Illinois, Urbana-Champaign received over $58 million in new NIH grants. For more funding information and other statistics at this university, including U.S. News and World Report rankings, see Interact with Researchers at the 2014 Urbana-Champaign Event. 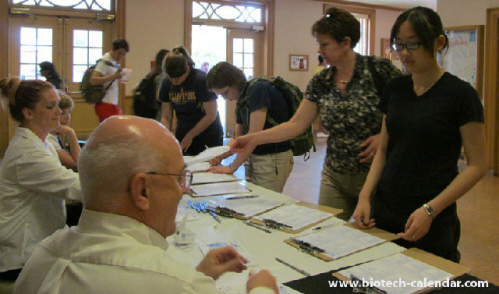 If you would like to meet researchers and market your life science solutions in Illinois, Biotechnology Calendar, Inc. invites you to attend our Urbana-Champaign BioResearch Product Faire™ Event on April 30th, 2014. This life science marketing opportunity is available to you with a special pricing offer when you register by February 1st, 2014. Biotechnology Calendar, Inc. is a full-service science research marketing and events-planning company that has been organizing life science marketing events at top research institutions nationwide for over 20 years. If you would like to meet researchers and market your life science solutions at lab product expos closer to home, see our 2014 calendar of events. To learn more about funding statistics at the University of Illinois, Urbana-Champaign, or for more information on this life science marketing event, click on the button below. Getting the best value on life science marketing opportunities in Illinois is as easy as registering early for Biotechnology Calendar, Inc.’s life science marketing event at the University of Illinois, Urbana-Champaign. Our Urbana-Champaign BioResearch Product Faire™ Event will take place on April 30th, 2014 on the University of Illinois campus. When you register by February 1st, 2014, you can save valuable marketing dollars on the price of exhibiting and be guaranteed an exhibit space, even if the event sells out closer to April 30th.